This book chronicles the small group or cell movement from Jesus all the way to the modern-day cell explosion. 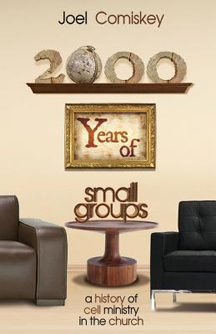 Comiskey highlights the strengths and weaknesses of these historical small group movements and applies principles to today's church. You will grow in gratitude and understanding of key cell values from those pioneers who have paved the way. You will also learn to appreciate those movers and shakers who faced far greater odds to implement small groups compared to the difficulties confronted today. And just like they found solutions in the face of persecution and trial, God will help you persevere, find solutions, and ultimately bear abundant fruit for his kingdom and glory!